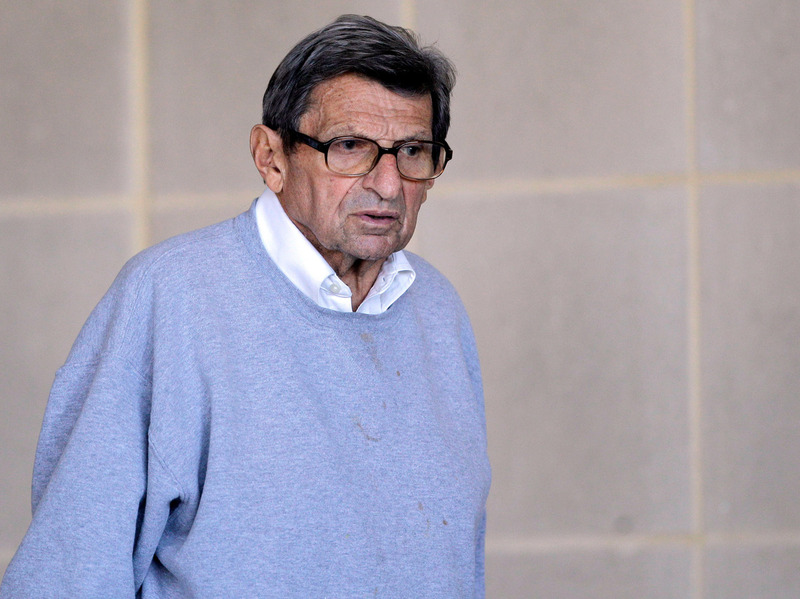 Paterno 'Sobbed Uncontrollably' Day After Being Fired, Book Says : The Two-Way Dismissed because of evidence that he didn't do enough to alert authorities to a former assistant's abuse of young boys, Paterno knew he'd been ruined. "My name," he said, was "gone." Journalist Joe Posnanski's book goes on sale next week. Joe Paterno on Nov. 8, 2011, the day before his firing. The first excerpts are out from journalist Joe Posnanski's upcoming biography of former Penn State head football Joe Paterno. As GQ, which has them, writes: Paterno gave Posnanski permission to spend last year's football season closely following him. What no one knew, of course, was that with just a few weeks to go in the season Penn State would be rocked by former assistant coach Jerry Sandusky's arrest on charges of sexually molesting young boys. Just days later, Paterno would lose his job for allegedly not doing enough years earlier to alert authorities about what Sandusky had been accused of doing.
" 'My name,' he told [his son] Jay, 'I have spent my whole life trying to make that name mean something. And now it's gone.' "
The Book — Paterno — goes on sale next Tuesday. GQ plans to post more excerpts next Monday. It also has more from the book in its September issue, which is on newsstands now. Paterno died in January. He had cancer. Sandusky was convicted in June on 45 of 48 charges he faced.